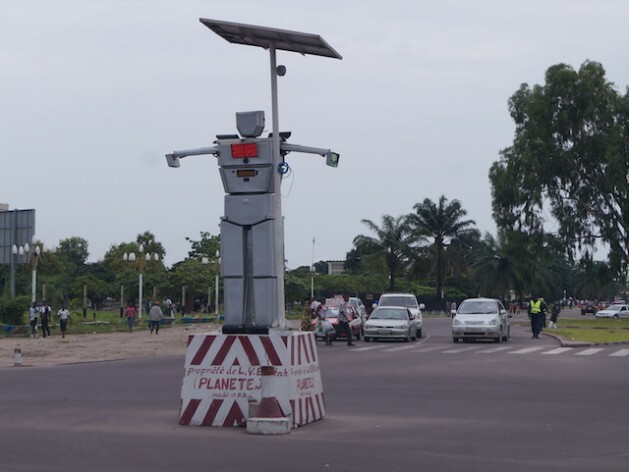 GOMA, DR Congo, Apr 30 2014 (IPS) - “There are several robots in the world, but that one which regulates traffic is made in Congo,” Thérèse Izayi, a female engineer and the Congolese inventor of two very unusual traffic signals, tells IPS. Situated at an intersection on Triumphal Boulevard, near the Democratic Republic of Congo’s parliament in the capital, Kinshasa, the 2.5-metre traffic signal looks like an actual robot — with arms, legs, a chest and a head. It is made from aluminium to withstand high temperatures and humidity, and the heavy rains of this equatorial climate. There are cameras by its eyes and on its shoulders, which continuously film the traffic. It is also solar-powered to ensure its independence from electricity. This robot is now a part of everyday life here and there is a second one on Lumumba Boulevard — en route to the international airport. Both are locally patented by Women Technology, an NGO that Izayi founded to give women engineers a platform. “The robot captures images, which it sends using the antenna on his head to the [Women Technology] centre that stores the data. It is also equipped with an automatic detection system that tells it that pedestrians want to cross,” Izayi explains. Izayi says that the recorded film could be sent to the traffic police, to allow authorities to prosecute drivers who have committed traffic offences. Kinshasa is a city where traffic lights are almost non-existent and the Highway Code is constantly violated. The capital city, with a population of 10 million, is known for its chaotic traffic. “The robot just solved the problem of corrupt policemen,” a taxi driver tells IPS. Traffic police, who earn small salaries, are often accused of extorting money from divers. They allegedly do this by stopping cars in the middle of the road to demand bribes, which results in constant traffic jams. “Traffic jams are often linked to police harassment more than traffic density,” Val Manga, president of the National Road Safety Commission, known by its French acronym, CNPR, tells IPS. The robots on Lumumba and Triumphal ensure quick stops and no policemen. 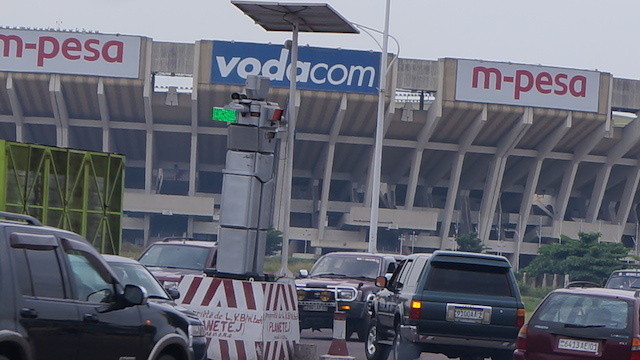 According to CNPR, there are around 400,000 vehicles on Kinshasa’s roads. But of the total number of vehicles in the country, only five percent are new. Each month, around 40 people are killed in accidents in Kinshasa, and 90 percent of these accidents are attributed to drivers’ faults. Izayi dreams of being able to sell more robots and create manufacturing jobs throughout the country. She hopes that she will be able to market her robot internationally but points out that she is restricted by the country’s lax enforcement of laws, corruption and a very slow administrative system. Izayi has tried numerous times to convince the government to support her project and still has not had much luck. Obtaining a patent is a difficult process here. The costs vary and it takes six to 12 months to get approval. Zacharie Kambale is a local inventor who has not been able to register a patent for his idea because he does not have the money for bribes. “I have to pay money informally to officials to get things done,” Kambale tells IPS. In 2012, Kambale developed Kongo Connect, a social network that is based in Goma. It has been nicknamed the “African Facebook”, and Kambale says it has more than 100,000 users. The site is currently down as Kambale adds more functions to it. Congolese economist Batamba Balembu tells IPS that he estimates four out of five companies in DRC have had to “give gifts” to get a business licence. He says that 55 percent of government revenue is lost to corruption. There is also no enforcement of legislation relating to copyright protection here, says Chrysostome Kwede, a patent lawyer in Kisangani in northeastern DRC. According to the World Intellectual Property Organisation (WIPO), legislation concerning industrial property was enacted here in 1982. Four year later, laws were put in place with regard to literary and artistic works. “The legal vacuum is the basis of corruption in the Ministry of Industry,” Kwede tells IPS. However, Izayi says interest has been expressed by the governments of Angola and neighbouring Congo-Brazzaville. “But I am not ready to provide them with prototypes like those in Kinshasa because it is expensive,” Izayi adds. The robots are expensive — around 15,000 dollars — and they cost about 2,000 dollars a month to maintain.